As a sophomore, Kalina Yingnan Deng ’14 became curious about the historical influences behind Boston public school desegregation in the 1970s. Now in her senior year, what started out as a single paper has become a project of passion, as Deng recently presented her research at a philosophy conference at the College of the Holy Cross. In Spring 2012, Deng took WRIT290 Advanced Writing in the Social Sciences with Senior Lecturer in the Writing Program Lynne Viti. 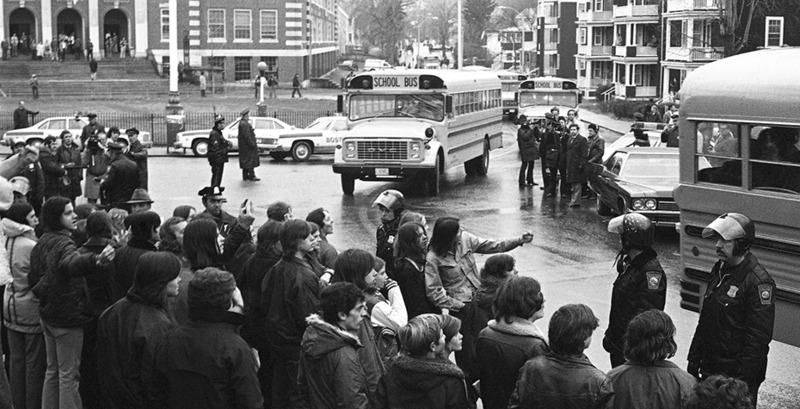 Viti focused the course on the movement to desegregate Boston’s public schools in the 1970s. A philosophy major, Deng became curious when one assigned reading made a brief mention of the Thomistic philosophical influences on Judge W. Arthur Garrity, the man who mandated the busing of students to desegrate the city schools in the landmark case Morgan v. Hennigan. Thomism is the system of theological and philosophical thought derived from the works of St. Thomas Aquinas, a system of thought that Judge Garrity became familiar with during his student days at the College of the Holy Cross. Deng herself was familiar with Thomism through another Wellesley course she had taken on ancient and medieval political theory. Drawing on these interdisciplinary connections, she set out to do some archival research and a few interviews to write the paper about the social and political context of Judge Garrity’s decision. Little did she know, the project would extend past Viti’s course and into the next two years, during which she would visit four different archives and conduct more than two dozen in-person interviews. Drawing on these interviews and archival research, Deng argued that medieval political philosophy was not only relevant to Judge Garrity’s understanding of the rule of law but also relevant to the shaping of social moral consciousness in the broader society. She pointed out that the judge’s reasoning, deeply shaped by his Irish-Catholic beliefs, should have resonated with many of the predominantly Irish-Catholic South Boston residents who originally protested the busing decision. Deng continued working on the project, titled “Fundamentally Moral,” after completing Viti’s course, eventually winning the Library Research Award for a 200-level course paper. In her senior year, Deng presented her work at the “Celebrating Philosophy” conference at the College of the Holy Cross, the institution where Garrity had studied and where she did much of her research. To that end, Deng says, “mentorship is key.” She credits the mentorship of another Boston-based philosopher, Wellesley’s own Ifeanyi Menkiti, with supporting her through her studies.